The German automaker has always stepped ahead of the competition to keep things a little more rare than the other guys. Example, the Speedster from Porsche has always been a Classic for its unique rear end styling and limited numbers of production. People want something that nobody else has seen or see very often. And since there are limited numbered units, the price goes up, especially over time because of the rarity. Just recently did Porsche come out with the white Speedster which is a beauty. 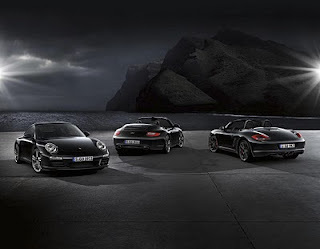 But now the other side of the color map, comes the all blacked out 911 Coupe and Cabriolet as well as the Boxster S. They have the Black Edition badging with the limited number run on it. Check out our later posts with a little more detail on each car.